Easy run through Redwoods. 1 mile paved trail from Canyon Meadow Staging Area. Can easily add on to that. West Ridge Trail. About 7 miles out and back. Flatter. Access from Skyline Staging Area. Bike Trail Loop. 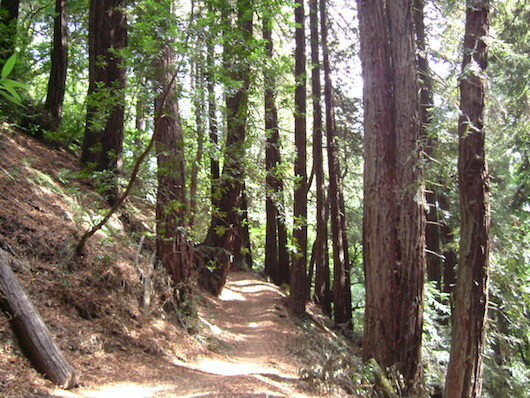 Follow the 8.2 mile Redwood Bike Route (East Ridge to West Ridge), which is a good circuit of the park (see map). Hilly! Note that Joaquin Miller Park is adjacent to Redwood Park, and offers additional running options, including the Sequoia-Bayview Trail. Redwood Gate is the main entrance. Numerous other staging areas. Reachable by public transport.